Ever wonder what a feminist city would look like? How would it change our approach to housing, employment and transportation? How can feminism shape our economies and communities for the better? A new discussion from Rotman is drawing together experts to ponder this intriguing question. At “What Could a Feminist City Look Like?” join Kofi Hope, Olivia Nuamah, Rosemarie Powell and Brigitte Shim for a dynamic discussion on the challenges and opportunities in creating a feminist city. Sarah Kaplan and Matti Siemiatycki will moderate the discussion. 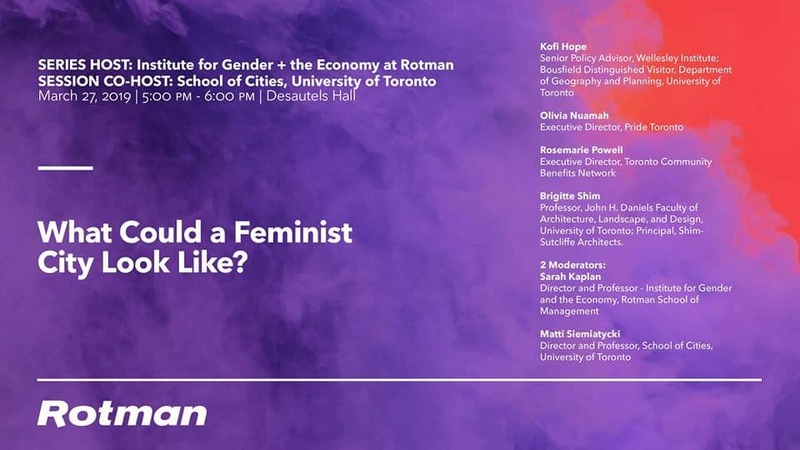 “What Could a Feminist City Look Like” takes place on Wednesday, March 27 from 5:00 to 6:00 p.m. at Desautels Hall in Rotman School of Management (105 St George Street). Learn more and register here. All are welcome to attend this free event.